The best defense against any illness is a healthy and strong immune system, and one of the best routes for a healthy, strong immune system is a healthful diet. But occasionally, bacteria or a virus do pierce through your armor, and sickness is the result. Thankfully, there are tons of different natural solutions for both preventing and remedying sickness. You probably know a bunch already, but here’s another natural cold and flu treatment you can add to the list – black elderberry. Black elderberry has been used in folk medicine for centuries. The bush is found in Europe and North America, where it is considered an “elder” plant in Native American healing. It’s been used by native tribes and Europeans as an immune booster and general tonic throughout the ages, while also being served as a food source in wines and syrup. Rich in antioxidants, black elderberry contains quercetin, rutin, and anthocyanins—all of which help to protect the cells against damage and illness. The berries and flowers both have antiviral and antimicrobial properties, making them great healers. 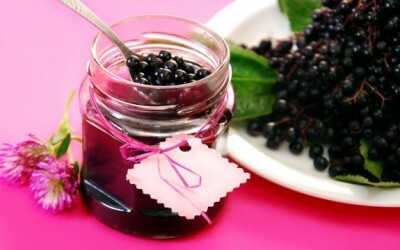 It has even been suggested that black elderberry could kill the H1N1 virus. Researchers with Hadassah University said the berries work on a cellular level to protect cells against inflammation and bolster the immune system. Black elderberry is available in supplement form. If you find the bush growing wild, do not eat the berries raw, as they may be poisonous unless cooked. We love elderberries! Thanks for this great, researched article. It's nice to see that it's not just folklore.